Npower’s lying salesmen tried to persuade my staff I back it! I was just popping out to an orchestral rehearsal when two Npower sales guys arrived at the door. They gave a nice spiel about having the best tariffs and no lock-in clauses and to sum it up they gave the great line of: ‘…and Martin Lewis off of Daybreak backs us too’. This made my wife and I smile, especially when I told them that I worked for Martin. The golden rule is – if you didn’t hear me say it, or if you haven’t read it on the main section of the site – then don’t trust that we really back it without checking first. The following picture says it all. 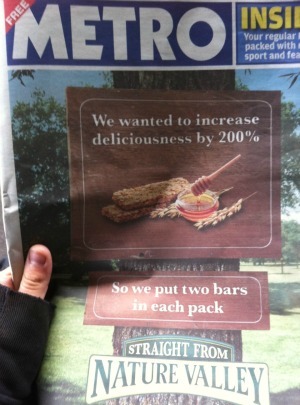 I’ve ranted before about the ridiculous mis-phrasing of numbers in the UK, (see my You cannot give 110% effort blog) but this takes the biscuit…(or granola bar). Thanks to @stephencgrant for the picture who sent it to my Twitter feed (via @lewiscook). For those who don’t see the problem. If you DOUBLE something, that is an increase of 100%. An increase of 200% means you treble the amount. On the day of the GCSE results coming out, is our national numeracy so bad, that no one in the ad department, agency or even any of the media buyers spotted this basic maths error? I am tempted to suggest that people start writing to Nature Valley to demand the missing third bar. PS. An updated thought: Nature Valley, if you read this and want to give a voucher for a free bar to people to make up for the error, I’d be happy to put it in my weekly email – which goes to 6m people. Wholesale energy prices are DROPPING. Was/ is fixing wrong? Four of the big six energy companies have announced price hikes to hit in the next two months, two more are expected to follow, yet the wholesale prices energy companies pay are dropping (see Wholesale rates at year low) – so is it worth locking in now if our prices may fall again? When wholesale prices are rising, energy companies respond quickly and put their prices up. It’s often said that when wholesale prices are falling, energy companies never respond and put their prices down – yet that isn’t true (though whether they do it with such speed and relish is debatable). As this uSwitch chart below shows, prices have and can move in both directions. So, the concept of energy bills dropping after rising should certainly not be discounted. However, over most two year periods – about the time most fixes last – they’re almost always rising. And there is no doubt that over the long run (5-25 years) the infrastructure requirements being put on energy companies means prices will rise. Is it worth fixing if prices may drop? For six months we’ve been saying everyone should urgently CONSIDER fixing, and the same holds true now. The key here is we’re saying check whether fixing is right for you – not a blanket – everyone should fix. Much of this info is already in the fixing FAQ part of the cheap energy guide but I wanted to spell it out in the light of the current wholesale price falls. Fixing should be seen as an insurance policyIf you are worried about price hikes, urgently consider locking into a fixed tariff, which guarantees rates for a set time such as 18 months to effectively insure against your prices rising. To decide if it’s worth it, first see how much you’ll payTo find out whether it’s right for you – you first need to know how it compares to what you’re currently paying (see compare energy tariffs for a full list on how to do it). Many can fix and save £150/year over their PRE-hike prices.If like millions you’re on an energy company’s STANDARD tariff, you may be able to fix and cut your bills by £150 a year. Now to clarify, that’s £150 a year over the pre-hike prices, so it could easily be a £300+ saving compared to the post hike prices. In this case, even if energy companies were later to cut their prices back down you’d still likely have saved substantially – so even if they did cut prices – to think you would’ve been better on your old tariff is unthinkable. If you don’t get a cheap fix this could all be baloney. I’m always slightly frustrated that while my suggestion is to ‘compare to find your cheapest fix’, I meet people who say: “Thanks for your help I called my energy company to fix”. It makes me want to groan. That isn’t the point – it’s not about locking in at all costs, it’s about locking in on the cheapest fix. If you have locked in without doing a comparison, there is a chance you’re paying a premium even over future rates to fix, which isn’t sensible. What if the comparison shows it costs MORE to fix? This changes the landscape. If you’re already on a super-cheap discount tariff and need to pay more to fix then it’s nowhere near as certain. Although do factor in the definite British Gas, SSE and Eon price rises hitting in the next month and predicted rises for Npower and EDF. Those increases are around 10%-20%. So if you’ll pay more than that on a fix, it’s likely to be best to stay put, unless there might be yet another round of hikes quite soon after this one. If the gap’s less, balance savings now against price certainty – factoring in the definite future rises, but also the chance that after that prices could rise further OR fall back again. Here there is less certainty of a saving so it is far more about your attitude. Fixing isn’t about ‘it will be the cheapest option’, it’s about ‘it will be a definite price’. The concept of fixing is not primarily about trying to beat the markets and win overall. For most, it is about peace of mind of knowing your bills CAN’T rise. You need to balance out the worst case and best case scenarios. Of course it’s possible in the future you’ll look back with hindsight and prices will have dropped after the rise, and you may have been able to beat the cheapest fix with a super-cheap online tariff (though as I explain below, in that case just ditch your fix).Yet this risk must be balanced against prices not falling, or even rising again and you having missed out on the chance to freeze prices at the current level. For most people running tight family budgets it’s better to ensure there’s no risk of hikes, paying at a level you can afford, than to play the market in the hope of gains if prices drop. If energy prices crash, the only risk is the exit penalty. Let’s take the most extreme scenario that could work against fixing; that after this round of 20% ish price hikes, energy prices then fall by 50% – so you’ve locked in at a rate that’s too high. Actually all that happens here is you pay the exit penalty of around £30 to £50 per fuel to leave – an amount that should at the minimum be covered for most people by the savings in the short term due to the initial price hike. In a way fixing is balanced in the consumers favour (provided you get a good price). Your lock-in is absolute, the energy companies can’t ditch you from it if things go against it, but if it’s wrong for you – you just pay a fee to leave. The last time prices rose then fell – people who fixed were still the winners. In early 2008, wholesale energy prices began jumping just like now, cheap fixes were being pulled just like now, so we were again then suggesting people consider capping. Then British Gas set a trend followed by others, announcing its biggest price rise EVER: gas UP 35%, electricity UP 9%. Further rises were expected the following January, yet the recession roller-coaster actually meant rates were then cut by 10%, although this still left most prices higher than when people capped. This meant everyone who capped or fixed their bills got peace of mind and according to a comparison industry report in February 2009: “Households that took out a fixed rate plan in July 2008 are currently paying £143 a year less on average than households on standard plans” – so even after that scenario people had still gained – though of course this can’t be used as a prediction. So in summary, if you want peace of mind, then getting a cheap fix is still absolutely the right thing to do. Do you still have rights if you pay in Tesco (or other) vouchers? Buy something from a store in cash and the store must obey the Sale of Goods Act rules. But what happens if you’re one of the growing band of voucheristas who buy without cash? In a nutshell your rights are identical. When you purchase goods or services you are entering into a contract between you and the supplier. They provide you with the product in return for a ‘consideration’. There is nothing that requires the consideration to be in cash – you just need to pay in something that is acceptable by the supplier. Therefore if you offer ‘Tesco Rewards Vouchers’ (where you trade-in normal vouchers for Rewards worth up to 4x the amount, see Tesco Rewards Boosting guide) and the supplier agrees them (which is of course due to its own contract with Tesco to do so knowing it’ll get some remuneration from Tesco), that forms your consideration. And if the voucher simply gives you a price reduction, then it’s even simpler. Your consideration is still in cash, just at a discounted amount. If you pay in vouchers, just like cash goods must still obey what I call the SAD FART rules. (For a full explanation see the Sad Farts Consumer Rights guide). Many people often mistakenly believe they have a right to take goods back if they change their mind. That simply isn’t true, whether cash or vouchers, you only have a legal right to take things back if they’re faulty. If not, it is totally up to the retailers’/providers’ discretion – it can simply choose not to do anything. Some do have published returns policies, in which case they’re enforceable as part of your contract. Yet if the policy says ‘no returns on goods bought with vouchers’ then that’s it – them’s the rules. If goods are faulty and you take them back straight away, then you have the right of a full refund (later you’re only entitled to replacement or repair). This refund should put you back in the position you would have been in if things hadn’t gone wrong, so it’s likely you’ll get vouchers back (though obviously it could chose to offer you cash, and then you have a choice to take that or the vouchers). Again just to emphasise, that is only if goods are faulty. If they’re not faulty, you’re at the mercy of the company’s returns policy. If it were to say, ‘if you pay in vouchers, any returns will be refunded in chewy cola bottles’ then that’s the rule. You then have a choice – keep the goods or get the cola bottles. This quick blog is more to ensure there’s a permanent record than anything else. Last week I was on a debate panel for CCCS at the Liberal Democrat conference. One fellow panellist was the coalition Consumer Minister, Ed Davey, so I took the opportunity to ask him about the Financial Inclusion Fund (FIF). In a nutshell the Financial Inclusion Fund provides much of the cash to debt counselling agencies – including Citizens Advice (CAB), to allow them to keep working and providing free help. The fund was under threat this year, but thankfully after much lobbying (including by this site – see my past blog, Don’t cut £25m of debt counselling – how to campaign against the Financial Inclusion Fund closure) it was maintained. I asked the Minister if at the end of this year, we could be sure the same desperate situation wouldn’t happen again, as both the risk to funds and the planning nightmare for the various help agencies could leave them with an uncertain future, and perhaps a need to make redundancies. His commitment was unequivocal: “I guarantee we will ensure that last year’s problems will not happen again, the funding will be there” – which is the first guarantee I’ve heard on the fund’s future. He then assured the room that the funding would likely come from a levy on banks and there would be no gap in funding while it happened. A CAB representative (called Laura) then followed up to note that the problem isn’t just the FIF, but also about local council cuts to debt counselling funding, which he acknowledged was an issue but one that was being looked at too. So there you go. I think Ed Davey is pretty committed to the job as Consumer Minister and seems to care. But even so, there’s no harm in having this written down on record as a contemporaneous note. Hopefully we can count it as a binding commitment. PS. Just a quick hello to the lady I met at the Lib Dem conference who’s on the women’s committee there – she was printing out vouchers from MSE and handing them out to delegates to ensure they got a cheap lunch – go you! “They do not bother, they frankly spend less time shopping around for a bill that’s on average more than £1,000 a year than they would shop around for a £25 toaster. Burnt by switching at wrong time in the pastPoliticians/regulators/comparison sites shouted ‘switch’ even when it’s not time. If you don’t intuitively understand the price, changing is scary. Energy companies have a myriad of different, similarly named tariffs, with complex price structures which make understanding the differences a nightmare. The door knockers who’ve come over the years each promising “to save you money” hurt those elderly people who still trust what they’re told face to face. Those on prepay meters, without web access. Not everyone can switch and save. There are structural problems. Some are locked in due to past energy debts, others forced to stay on prepayment meters, while there is some competition (see the Prepay energy savings guide) the benefits can still be limited. Timing, problems, and energy salesmen.There are of course those who’ve suffered a never ending hell after switching, when the transfer doesn’t take place properly. Or it does but it drags on for months. This has improved, but the institutional memory people have still leaves many put off by fear. Again, people are burnt as their cost dropped but debit increased. Many people get confused between the cost of energy and the money coming out of their account each month. Energy companies set Direct Debits by estimating annual usage and dividing it by 12. In a rising market, you can switch and save but pay more.This is another of those ‘burnt in the past’ issues. It’s a conceptual one that some struggle with. If prices are rising by 20% and you switch to a company that’s 15% cheaper, you’re still going to be paying roughly 5% more than before. He nodded like a man who knows he’ll bear the brunt if some choose between heating and eating this winter. After all, if I’m being swamped with Tweets on it, I suspect constituency mailbags are jammed too. At a typical £1,300/year gas and electricity is a far more tangible problem for UK voters than the Greek crisis. Yet don’t hold your breath for price cuts, although most energy companies will freeze prices this winter, which may help a little if a long cold spell pushes demand high. Then again, after two price hikes in the last year, it’s cold comfort. Ultimately rich energy tarts like me who play the system, pay £200-£300 less than those who are poor, scared, disenfranchised or confused. The easy fix is to force firms to cut all standard tariffs, but the political cojones aren’t there to push up against the big six providers and make that happen, though plans to simplify tariffs may reduce the difference in the long run. Instead, right now Energy Minister Chris Huhne wants people to switch and save. And in lieu of prices cuts, the Government’s new Check, Switch and Insulate campaign is EXACTLY the right thing to do. Then again I would say that, I’ve been yelling for people to do it for ten years now – so seeing the politicians pull this from the hat as the grand fromage solution at this highly publicised summit was frankly, slightly depressing. Mistiming. Too often politicians and regulators urge people to switch once a big company’s announced price hikes. This is actually the worst time to switch, as the company you switch to follows suit and hikes its prices the next week. Instead it’s best to wait until all the big firms have hiked prices so there’s a level playing field for comparison (like now – it’s currently the PERFECT TIME to switch). You gain not save. When prices are rising 25%, if you save 20%, you still need to shell out more than before, even though it’s £100s less than you would’ve done otherwise. Unless this is explained, when people switch and find they’re paying more, they think they’ve been diddled. See more issues in my Why people don’t switch blog. Any campaign must tackle real world problems like these, as well as follow through on plans to speed up transfers and block price rises after switching for six months. Even so, right now the big call has to be COMPARE NOW to see if you can gain £100s, (see how at www.moneysavingexpert.com/gaselec ) and why not speak to elderly relatives who are less likely to switch and help them too. Plus many are also eligible for free insulation. Finally, spare a moment for the big energy company boss who made an emotional appeal that we must all work together to help energy companies be trusted again. I may’ve upset him when I said I’d tell consumers NOT TO trust their energy company. After all, with some customers paying £100s more than others for the same thing and Which? showing call centres are giving out incorrect tariffs, surely before we trust them, they need to become trustworthy. I’ve spent this morning thinking, reading and making points for this afternoon’s energy summit. It’s hosted by the PM and Energy Minister Chris Huhne, and the big six energy providers, regulator Ofgem and a few consumer groups will be there. The meeting is a closed meeting, so I’m not supposed to divulge what’s said, in order to aid open discussion. So I thought why not publish my notes in advance of going. These are a mix of my provisional thoughts and your feedback on the PM’s article on energy, which we published on the site this morning. They’re very scrappy, short-hand personal memory cues (in no particular order – I’ll prioritise later) so I hope you’ll get the gist…it’s worth noting quite a few of the simplicity measures have already been proposed. Yet I think tackling the barriers to switching and getting faith back in the system are priorities. People have little faith in this summit. This cannot just be a talking shop. We need to see real, concrete, immediate action taken on the back of it. Winter is coming. Prices need to come down now, full stop. £1,345 per year average price is too high. Wholesale prices have dropped, so energy companies need to cut prices – there is huge anger in their high profits and our high bills. The PM needs to deliver reductions. Switching needs to be easier and quicker, and to work – too many are put off by the process. Many worry about cash flow, as by switching they’ll need to meet any debt hangover there and then. Plus there are many barriers still in place. After the terrible decision to shut Consumer Focus, who will regulate comparison sites? There needs to be price certainty when you switch, for example the price given at that time should not be allowed to rise for a set period – e.g. 9months or a year. Need to incentivise owners of rental properties to insulate and be more energy efficient. End to doorstep sales – it has hindered, not helped and it annoys people, although at least energy companies should now obey no cold caller signs unlike others companies. We need to get people to focus on their tariff, not their company. Tariff names need to be more distinct from each other to stop confusion. People want LESS choice. There is overwhelming support to get rid of confusing tariffs, as seen in our poll results (see the Should we simplify tariffs? poll result). Confusion marketing by the industry has shot itself in the foot. Decent compensation should be given to those who’ve been mis-sold in the past (see the Energy mis-selling guide). There are also a lot of disaffected people who just miss out on warm home discount and don’t qualify. Many working families on low to mid incomes are being slapped across the face by high costs. The Government and the regulator need to smarten up – yelling ‘switch’ at the wrong time leaves people burned. NOTE: my press release comment on the PM’s statement is…”Past behaviour from all parties, and the regulator, has shown they don’t understand the real world of bills. They need to get more sophisticated. “I’ve lost count of the times I’ve heard them yell ‘switch’ when energy companies hike prices. Swathes of consumers are burned as a result, as they move from the frying pan to the fire as their new provider hikes bills too. “After such an experience, many won’t switch again. In fact, the time to compare, switch and save is later, once all companies have increased prices (as they have now) so there’s a level playing field and you can see who’s truly cheapest.” PS. If you haven’t done a comparison do one now, see the Cheap gas & electricity, plus cashback guide for more info. Why do lower users pay more for units? The discounts for high usage ‘push’ behaviour the wrong way. Direct Debit and price confusion – needs clarifying how DD will be set. People need to be encouraged to give readings – smart meters when introduced, should help. Language of ‘savings’ leads to disappointment in the market – as bills may still rise, just not as much. People gain from switching but they don’t feel or realise it. This needs to be tackled as it’s one of the reasons for disenfranchisement in the system. It’s about time home heating fuel got some regulation too. Prepay customers are still 2nd class energy citizens trapped on higher bills. While it has improved, it’s still not enough. The rental legacy issue is a problem, as is the cost of switching to a credit meter even when your credit score is good enough. Comparison sites coming up with different answers doesn’t help the trust – needs more work to ensure that this adds up. Need to encourage phone based switching for older people, so they don’t have to go via the internet. Annual statements launch was farcical. Why not just make bills clearer and force providers to list what tariff you are on along with a summary box on exit penalties, when any discounts change, when you last switched and whether any lower rate tariffs exist? We need more insulation and energy efficiency initiatives delivered directly. Plaudits to British Gas for its insulation scheme and the fact all customers with dual fuel get it – not just a limited tranche. People don’t believe competition has worked, calls to renationalise. General view is that energy companies are profiteering. Some say why have a go at energy companies for huge profits, when an even bigger chunk is made up from tax. Lack of competition with only six main suppliers in a vertically integrated market. Big added costs to our bills, which only result in companies giving away a glut of free energy saving light bulbs isn’t good for anyone. Public worry that big green energy investments will push up prices – many are unhappy about this added chunk on bills. In a rough spot Facebook poll this morning 3 to 1 favoured prioritising low bills rather than green investment. I’m disappearing off soon to go to the meeting, but I will try and glance at any comments below beforehand.